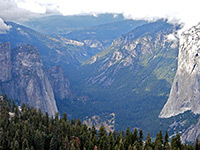 Sentinel Dome is an easily-reached example of the rounded granite summits found all across the high country of Yosemite National Park, and at 8,122 feet it is high enough for far reaching views over Yosemite Valley, the surrounding forest and many mountains to the north. 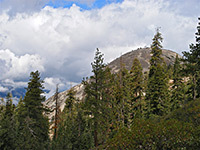 The dome is the third tallest peak along the Glacier Point Road (after Illilouette Ridge and Ostrander Rocks), though the climb to the top requires only a moderate elevation gain of 400 feet. The starting point is the same as the path to Taft Point, 2.2 miles before roads end, and while both places can be visited on a 5 mile loop (partly along the Pohono Trail), it is quicker to make the two direct hikes separately. The 1.1 mile path to Sentinel Dome passes a mix of smooth granite slopes, pine woods and piles of boulders, soon reaching a flat, open area beneath the dome, where the trail meets a disused paved road that links with the main highway 0.7 miles beyond the trailhead, so the hike could begin from here - the side road is closed to vehicles but has a small parking area. If so, the route to the summit is only 0.5 miles. When approaching from the south, the dome looks too sheer-sided to climb, though the eastern slope has a more gentle gradient. The last part of the route to the top is along the old road, ending with quite a steep ascent to a ridge on the east face (and a junction with a connecting path to the Pohono Trail), then a 100 yard scramble through granite boulders to the summit. The mountain has no single high point, rather a flattish top with several large boulders and a few windswept bushes. Once there was an ancient, twisted Jeffrey pine tree that formed the centerpiece of many photographic compositions before falling over in August 2003, having died several years before. 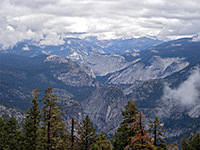 The panorama from Sentinel Dome encompasses 360° but the views are rather distant, as the surrounding wooded slopes obscure the immediate foreground; the are no spectacular downward vistas as with Glacier or Taft points. The hike is relatively popular, taking an hour for the round trip, and summer days might see several dozen people on the summit at any one time.